While scars may carry a sense of pride for some people, most are unhappy with the presence of scars on their body. This is mainly because of their physical appearance, but deep or extensive scarring can be problematic for tissue health as well. Our bodies are held together by a network of supporting fibers, one of them being collagen, which forms a mesh-like net which provides a structure for our cells to attach to. However, when an injury is worse than a minor abrasion, it heals in part by laying down thick cords of excess collagen, which aligns to form bundles, causing the thick, fibrous appearance that we call scars. These scar tissue formations usually do not perform the same as normal skin or organ tissue, and can cause a loss of function. For example, scars on the skin are hairless and are unable to produce sweat, while internal scars can reduce muscle flexibility and mobility. Arrhythmia and cirrhosis are serious conditions which can arise when scar tissue forms in the heart or the liver, respectively. In some cases, these scars can be painful as well, and can cause related disorders such as tendonitis or joint problems. It is not a surprise then that there is growing interest in scar removal therapy. A recently-developed method for scar removal, which has been used successfully by Blue Hills Sports & Spine Rehabilitation in the Boston Area, is known as the Graston Technique. This therapy is non-invasive and causes little to no discomfort during treatment. It employs a medical technique called “soft tissue manipulation/mobilization,” and is a form of therapeutic massage using a rigid, stainless steel instrument to identify sites of injury and to promote proper healing at the area. Clinical trials testing the Graston Technique against other forms of physical and scar-removal therapy have been conducted since the mid-1990’s, and a number of doctors and rehabilitators have become trained in the technique since then. It is now used at all four of Blue Hills Sports & Spine Rehabilitation locations to treat a wide range of conditions, including scar tissue reduction, tendon disorders, carpal tunnel syndrome, fibromyalgia, joint pain, and post-surgical scar treatment. The normal healing process involves the migration of a type of cell known as “fibroblasts” into the site of injury, where they produce stimulatory chemicals, convert into the types of cells that have been lost, and replace structural lattices destroyed in the damage. When this damage is extensive, the fibroblasts will hastily cause wound-closure by putting down bundles of scar-forming collagen, rather than filling in completely with the correct cell and structure protein types. 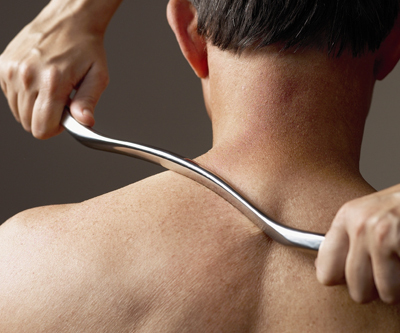 As a doctor rubs the Graston device over the affected area, the mechanical force gently disrupts the scar-forming fibers. Local fibroblasts are able to sense this mechanical stimulus, and are reactivated to perform their healing responsibilities. Researchers have identified increased fibroblast migration and proliferation in areas of scar tissue following treatment with the Graston Technique. The inflammation caused by the micro-traumas and fibroblast infiltration re-initiated the healing process at the injury site, and the fibroblasts are able to convert more of the damaged area into normal, functional tissue. Stimulation by the Graston Technique can cause a number of other positive benefits in the region, including blockage of pain signals, muscle relaxation, formation of new blood vessels, and increased immune system function. Disruption of scar tissue by the Graston Technique allows for muscles and joints in the region to regain their normal range of motion. Likewise, the renewed healing allows the new tissue to perform its basic functions, and will look and act like a normal body part again. Perhaps most importantly, the amount of pain coming from the scar will be significantly decreased. People who have received Graston Technique therapy have reported a number of positive outcomes, such as better flexibility, less back and joint pain, and improved athletic performance. Use of this technique during initial healing can shorten recovery time and increase the extent of healing. Such benefits may also be enhanced by combination with other forms of physical therapy including stretching and strengthening exercises. As the Graston Technique is non-invasive and does not involve taking any medications, this method is a relatively safe form of therapy, and may be especially beneficial for people with physical or medical conditions that may prevent them from participating in other forms of therapy.